Hey hey, Girl Reporter is back! This is where I channel my inner Lois Lane to bring you the most interesting stuff from my Google Reader for the week. $550 khakis, the latex designer to the stars, and more! That's it for this week, folks. Happy Friday! What a great article on what goes into the making of the khakis. In a world where most people buy mass-produced-in-China clothes, I don't think the average person realizes what goes into the making of a pair of pants. I hope many Etsy sellers do take the time to read the article. As someone who sells on Etsy, it drives me utterly insane how so many sellers completely underprice their goods, and clearly do not take into account the time spent on them! The cost of quality comes high; the cost of the cloth alone is more than the Gap sells a pair of khakis for. At least the operators get a decent wage for their labors. You are so awesome. Best links EVER! Diving in now to get caught up on these fascinating stories!!! I'm not even sure the mark-ups were ridiculous. Remembering it was marked up twice - once by the manufacturer (fair enough, he needs to make a profit), and once by the retailer (fair enough also, they need to make a profit - think about their overheads, marketing, etc. It's not 'free' for them to bring the goods to market). Clearly etsy sellers don't have the same retail costs as a bricks&mortar store, so the situation is a bit different. But yes, they should be looking at the breakdown regarding how the manufacturer costs and marks up the goods, and learn from that. sorry, meant to post it as a link: story of stuff. Videos and blog about industry manufacturing and economy. One criticism I have heard from others, however, is "textbook liberal agenda." One plus of sewing, even if you aren't a pro such as yourself, is that you become aware of clothing construction, fit and fabric. 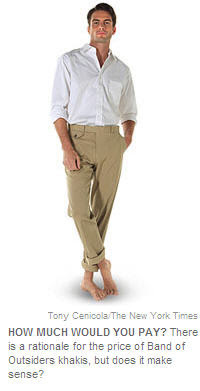 Re: the $550 khakis. They are made by Martin Greene's facility in Brooklyn and I'm not even sure that if you were able to split off the cost/price of the pants from one of Greene's suit, they'd be $550. I think there is a bit of 'we do because we can' in this, but I'm still very glad to see that someone is making something in the US. small bit of news: the Hugo Boss suit factory in Cleveland is still open. The company threatened to close it down and move production to Eastern Europe - oh, they WERE making plenty of money there. The production was very profitable - it's just that they could make MORE by moving it to Eastern Europe. Ultimately the decision was made (under public pressure, the campaign for stars on the red carpet NOT to wear Boss tuxedos AND say so publicly, which they did and so on)to keep the facility open but I'm sure we will hear about this again. Re: plus sized models. How many different "types of women" must be represented by the fashion industry for us "real women" to be satisfied? How about petite models? Petite but plus sized models of color? Do they even exist? Not sure how I feel about etsy telling people to charge more....I guess i feel conflicted. But I think I lean more towards the fact that it's a mainstream venue- for the eveyday folks. And honestly- I often just about choke when I see a bunch of t-shirts marked up to $50-80 bucks. Just makes me wonder who on earth has $80 to pay for a shirt and would buy it off etsy? Isn't there a different market...say at boutiques? Also my big problem is that to ask someone to pay that much for most of your items you'd have to truly and utterly claim that the design/concept/ whatever is COMPLETELY yours. No "inspired by" or influenced from other designers. If you are making something influenced by those designers for the mere mortals (at an affordable price) then fine. But basically I'm thinking- don't kid yourself. Especially if you got the idea from someone else on etsy or from claires or anthropologie. Just sayin. Can you imagine? I think my mother would have fainted dead away if our back-to-school clothing budget went over $150, including winter coat, and that was a lot closer to 1962 than we are now! I also read that Times article about the khakis. It sort of bugs me that the focus is on such a high-end item, as if that's what any good quality, union-made garment will cost. I'd like to know what a pair of khakis equivalent in quality to a pair from the Gap might cost if made in the USA with union labor. Probably not less than $100 but not $550 either, right? Anyway, as long as there's the Gap, H&M, etc., the vast majority will never spend that kind of money on clothes -- and probably couldn't if they wanted to. Hmm...off to read the NYT articles. 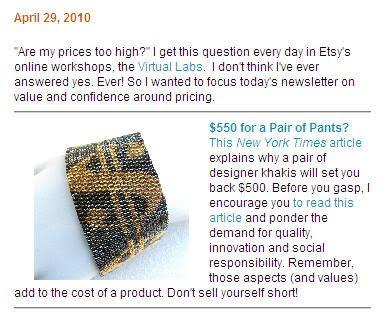 Interesting about the etsy newsletter. The challenge with etsy, I think, is that there will always be a mix of "pro" sellers and "hobby" sellers. Not everyone on there wants to quit their day job and sell full time -- many are simply destashing supplies, selling as a hobby, or crafting for fun and delighting in the thrill of a sale. For these sellers, there's a motive to price lower -- which makes it much harder for the full time sellers. I gotta agree with Amy & Dana. Back when I did art or craft shows I priced by factoring in the cost of my materials, plus my time. People just aren't willing to pay a handcrafter what they're worth when they can get something similar made in China and sold at the Sprawl*Mart for a fraction of what an Etsy type wants to charge. We've created a culture where "cheap" is valued more than "handmade" or "custom-designed". It's sad - and it makes it harder on creative types trying to make a living with their handwork.